Hello. As we head away from East Antarctica over a pretty substantial cloud deck, I thought I’d take this opportunity to give you a sketch of our day (Oct. 29) on the DC-8. After arriving at the airport about 7 am, we faced a tough weather situation with clouds across almost all targets. In the end, we decided to head out towards a feature called Recovery Glacier – really an ice stream – that has some unique characteristics that make it worth the long flight there and back and the fuel we need to burn. 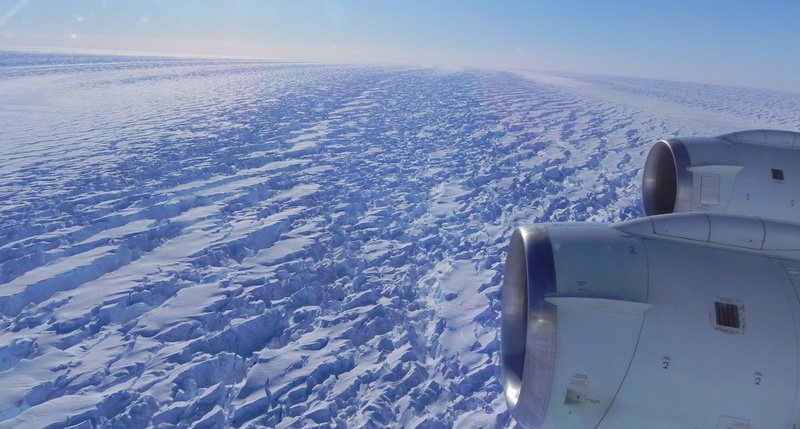 For background, Robin Bell at Lamont-Doherty Earth Observatory at Columbia University led a paper that got published in Nature (2007) where we documented that this fast flowing ice extends deep inside East Antarctica. It also widens as it goes inland. Only the Lambert Glacier and its adjoining Amery Ice Shelf can really compare to the extent of the Recovery Glacier with the Filchner Ice Shelf. Its scale alone makes understanding the Recovery Glacier important. Because of its isolation from research stations on the continent, it is also rarely measured either from an airborne platform or traverse. In the Nature paper, we documented that the Recovery widens its velocity field upstream most likely because of some unique characteristics at the ice-bedrock interface, including some probable lakes – trapped pockets of water or very wet sediment basins. Even some distinct geologic edifices penetrate up into the overlying ice. We showed that these features are located where the ice sheet distinctly changes in character. Here it flattens, accelerates and forms flow features visible at the ice sheet’s surface. 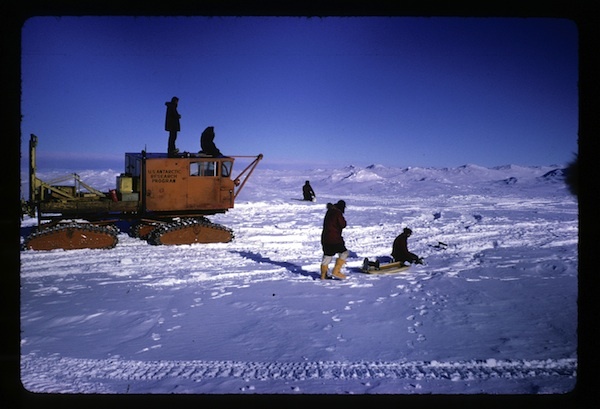 Only two ground traverses have reached the Recovery, the US-UK South Pole to Dronning Maud Land effort in 1965-1966 and the Norwegian-US International Polar Year program in 2007-2009. 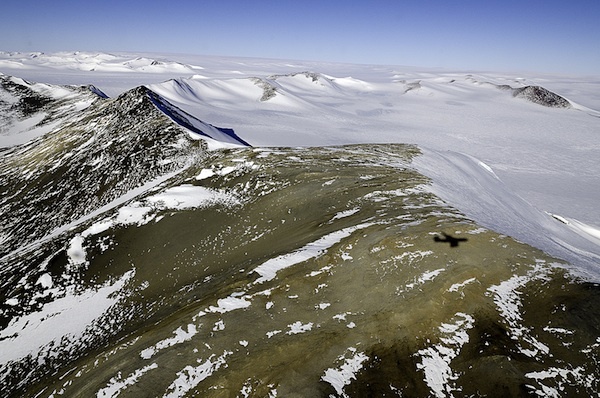 So today’s mission and one earlier this season have taken advantage of the DC-8’s long range to get a suite of geophysical sensors along and across it – to define its width, depth (using radar), elevation (using laser altimetry) and the area’s bedrock character including possible subglacial lakes (using gravity and radar). This mission focused on the lower reaches of the Recovery as it bends around the Shackleton Range, joins the smaller Slessor Ice Stream, and pushes off the bedrock to form the majority of the floating Filchner Ice Shelf. If you are trying to place it on the globe, today’s research target is almost due south of the Atlantic Ocean. With better luck, we’d see some of the Antarctic Peninsula as we fly to and from our base of operations in Punta Arenas, Chile. We crossed over the Larsen C ice shelf on our way back and it was obvious that the peninsula is once again covered in clouds. The glaciers of the Antarctic Peninsula are much smaller than the Recovery but have been changing dramatically recently. Some glaciers there have lost hundreds of feet in elevation and retreated inland in the past decade due to the collapse of their fringing ice shelves. For example, the Crane Glacier now flows freely into the ocean since the Larsen B ice shelf collapsed in 2002. The significance of ongoing changes to Antarctica’s fringing ice shelves is something that has only recently begun to be fully documented by researchers. Punta Arenas is currently hosting a US Antarctic Program (USAP) ship, the ARSV Laurence M. Gould, that is doing research in the oceans off of Antarctica, as well as supplying the USAP’s Palmer Station. Punta Arenas is also a logistics hub for a number of other nations who have stations in the Antarctic Peninsula including the British Antarctic Survey (BAS). Two of their Twin Otter support aircraft were at the airport today and are quite distinctive in their black and red paint schemes. Even better though, one of my all-time favorite planes was also there this morning: a modified DC-3 equipped with skis for snow runways. There is just something timeless about its design with its nose up and tail tipped down with big tires under the engines. It reminds you of past explorers in remote Antarctica and reminds you to appreciate all that can be accomplished with it and other great aircraft like the DC-8.